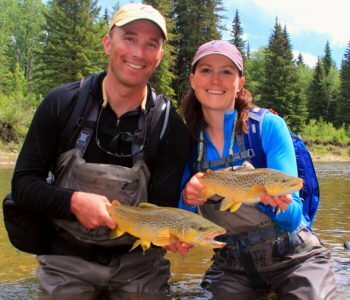 Learn fishing trips and techniques from your hosts, Dave and Amelia Jensen. Float and wade fish in freestone rivers, spring creeks, gin-clear lakes and the world-famous Rio Rivadavia. Experience an optional 3-day wilderness float on the rarely-fished Rio Chubut. Comfortable accommodations in a scenic mountain valley overlooking the Tres Picos. Reserved for fly-fishing only, the Rio Corcovado runs wild and clear across the pampas and through 45 miles of the vast Estancia Tecka. Enjoy opportunities to wade fish over 40 miles of private beats on the Tecka River, a classic, meandering spring creek. Indulge in classical Argentine and Patagonian cuisine while drinking top, Argentinian wines.